I had a quiz on my first day working at Dunkin’ Donuts. Not a written exam or a kitchen test on making donuts (those came later), but an on-the-spot quiz. My new boss Rob gave me a tour of the office building. At one point we arrived at a conference room. He opened the door to show me the room and accidentally interrupted a meeting. The meeting participants didn’t mind though and allowed Rob to introduce me. After he made my introduction, he pointed to each one of the twelve meeting participants sitting around the conference table and introduced them – their name and their job. Rob was a bit of an imp. I took a deep breath. Then I acknowledged each person by name. Rob was impressed. And my relationship with each of those people was off to a great start. People who know me know that I have a pretty good memory. I have a knack for remembering numbers, conversations, birthdays, and other information. But when it comes to remembering names, I have to work at it. Without a concerted effort, I forget a name almost as soon as it is said. So how did I pull off the Dunkin’ feat? Luckily I had taken The Dale Carnegie Course® a year and a half before I started at Dunkin’. 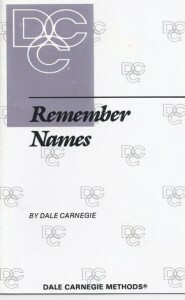 Carnegie’s three steps for remembering names are: (1) impression, (2) repetition, and (3) association. When you meet someone, you want to hear their name clearly (or get to a point where you have understood it correctly) and then immediately begin to build an impression of them. The person’s size, distinguishing features, and voice all contribute to that impression. Next repeat their name frequently – in conversation with them or silently to yourself. This point made so much sense to me. Perhaps the single best thing I learned in my Psych 101 class in college is that you have to hold something in your short term memory for at least 15 seconds for it to make the jump to your long term memory. And I held that fact in my mind for at least 15 seconds! Third, create an association with that person. The strongest way to do that is to formulate what Carnegie calls a “mind picture.” A mind picture is an exaggerated, absurd picture you imagine that relates to the person’s name. One example that Carnegie gives of a mind picture is for the name Warlawski. He suggests that you imagine Mrs. Warlawski in a uniform (war), carrying a law book, and wearing one ski. War-law-ski. Just as a person’s name is your point of access to them, your brand name is the access point to your brand and all of the products or services in your portfolio. Carnegie’s three-step process is not only great for helping you remember names. It is also a great context for defining and communicating your brand name. Focus on making an impression, repeatedly exposing your audience to your brand, and creating meaningful associations with your brand. Easy to pronounce so your target audience can learn it quickly. Remarkable in the way that it is unrelated to what your brand offers (think Apple Computer). Supports the three or four brand attributes that your brand is most known for (or that you’d like it to be known for). Communicate with your audience often to help them remember your name when they need what you offer. To be successful personally and professionally, channel Cheers. Know everyone’s name. To market your brand successfully, be the name that everyone (in your target market) knows. Though I left the company 15 years ago, I remain in touch with many of my Dunkin’ colleagues. I don’t remember how to make the donuts though. And that’s fine with me. P.S. 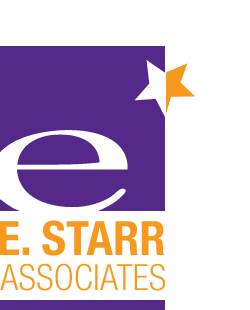 Want to know more about Dale Carnegie’s method for remembering names? Check out this well written blog post from their Ohio/Kentucky franchisee.